Special thanks to Evee Goodyear, who assisted on this review. Note: Almost all of the following cases are also available for other iPods and the iPhone, so check the companies’ web sites if you are interested in obtaining a sleeve or case for your specific iPod/iPhone. Some products ship with/without belt clips and arm bands, FYI, so make sure you’re ordering the best model for your lifestyle. ShadesCases come in a zillion different explosive, vibrant colors. These tight fitting sleeves protect your iPod Classic, but have minimum cushioning against impact damage. Display visibility is good, and scroll wheel operation is acceptable. Port access is excellent. 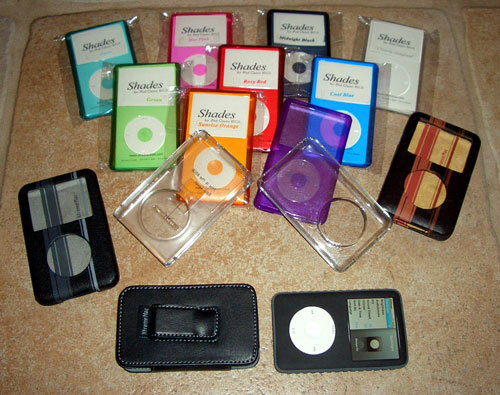 ShadesCases are reasonably durable, because their fit is so snug as to become the de facto iPod exterior surface. I was skeptical when I first read about and saw them, but during several weeks of nonstop usage, I was impressed with ShadesCases’ very tight, flexible grip on my iPod. Agent18’s clear, rigid case is a no-nonsense way to protect and use an iPod Classic. Both the 80GB and 160GB models ship in the same package, which is a bonus. One front fits all, and a separate back is used for each model, with their different thicknesses. Pay the extra $5 for the Kit, which adds a tilting rear leg to the basic Shield, for ease in watching movies, shows, photos, and songs with the iPod standing up. Agent18’s case is clear, sleek, firm, and snug. Not much impact cushioning, but solid protection. Very good wheel and port access. Be careful when removing an iPod from this case or the one reviewed below, because your iPod could go flying out of control while you are gently !! attempting to pry it away from the cases’ protective backs. Microshield is a slightly slimmer but almost identical competitor to Agent18’s clear Shield case, reviewed above. For the same money, if you want a little less bulk with a bit more flexibility, Microshield will be fine. I don’t use Microshield as frequently as I do Agent18’s Classic case, because I prefer the extra heft of the latter, but this is a personal choice. Both 80GB and 160GB iPods can be covered from the same purchase (one at a time), as with the Agent18 Shield case. Tuffwrap is my personal favorite from all the cases being evaluated in this combo review. It is almost identical to the ezSkin Classic, reviewed here <http://www.mymac.com/showarticle.php?id=3105>. A major difference is full tactile access to your iPod’s scroll wheel, which we applaud. Tuffwrap is a well-constructed slip-in rubber cover. The material is soft, attractive, and easy on the hands. Front panel is black, and rear area is dark grey. A Tuffwrap-encased iPod does not call attention to itself, which is a definite security feature. Cushioning is good, and port access is excellent, with (bravo!) a durable flap to cover an iPod’s dock port. Verona Sleeve is constructed of high-quality, durable semi-rigid leather, and is designed with vertical stripes in each different color choice. Your iPod slips in from the top. Cushioning is good, with fur-like interior padding. Port access is slightly awkward due to the physical thickness of the firm leather. MyMac has never fully warmed to this “original concept” iPod case design, but it remains extremely popular. Verona Holster is a cushy, premium leather version of the belt case that was included with many of Apple’s early iPod top-tier models. The iPod slips in for safe, comfortable storage and travel, without any access to display or wheel. The attention to detail on this $30 case is exceptional, but most users will not be happy pulling their iPods out of a holster for even the most basic operation. If you are an executive who listens to a playlist, and you don’t care to handle your iPod during a commute, you should consider XtremeMac’s Verona Holster.